"Moses said to Pharaoh, 'I leave to you the honor of setting the time for me to pray for you and your officials and your people that you and your houses may be rid of the frogs, except for those that remain in the Nile.' 'Tomorrow,' Pharaoh said" (Ex 8:9–10a NIV). I remember hearing about an old sermon preached years ago simply entitled "One More Night With the Frogs," about procrastination. Tomorrow?! You want the frogs to be gone TOMORROW?! Why not NOW?! Why the delay?! Why wait?! Why not ask God to do it now?! Why not make the decision NOW to do what God has asked you to do?! Why bear the stress and pain another night? Why spend one more night with the frogs?! The truth is most make this choice every day. We're carrying a heavy burden. We're experiencing stress and maybe even pain. There are some decisions we know we need to make. We know God is asking us to do something. We need to make a decision. Instead, what do we do? We put it off. We procrastinate doing what we know God is asking us to do. The result? One more night with burden and stress. One more night with the pain. 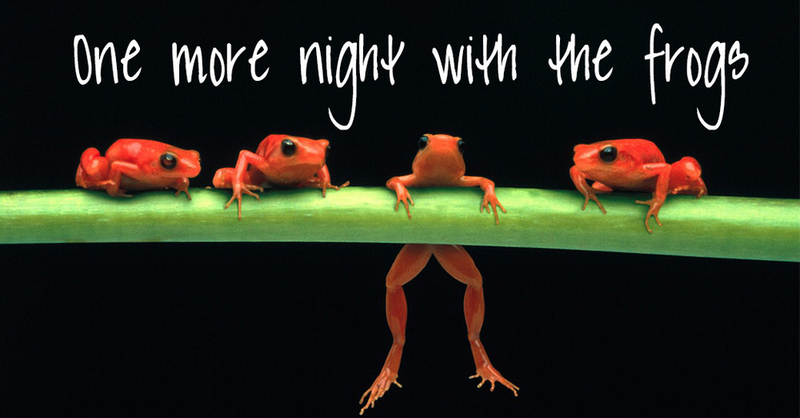 One more night with the frogs! That's why the most dangerous decision we can make today is NOT to make a decision; to put off what we know we need to do...to procrastinate! What are you putting off today? A relational decision? A financial decision? A professional decision? A spiritual decision? A ministry decision? I know you're afraid of the consequences. I know you're afraid of making the wrong decision. However, NOT making a decision is probably the most dangerous decision you can make because it causes you to stay exactly where you are, just as you are: stuck with the frogs of stress and pain. Don't spend one more night with the frogs. Make the decision you believe God is leading you to make today. God will set you and others free when you do! Let me know how it goes.